NamSor API will be featured today at SXSW ‘on stage’, so if you are in Austin: don’t miss Samir and Arnaud’s inspiring talk on ‘TechDiasporas: African and Asian Startups Fuel‘ and the launch of #DIASruption web site. 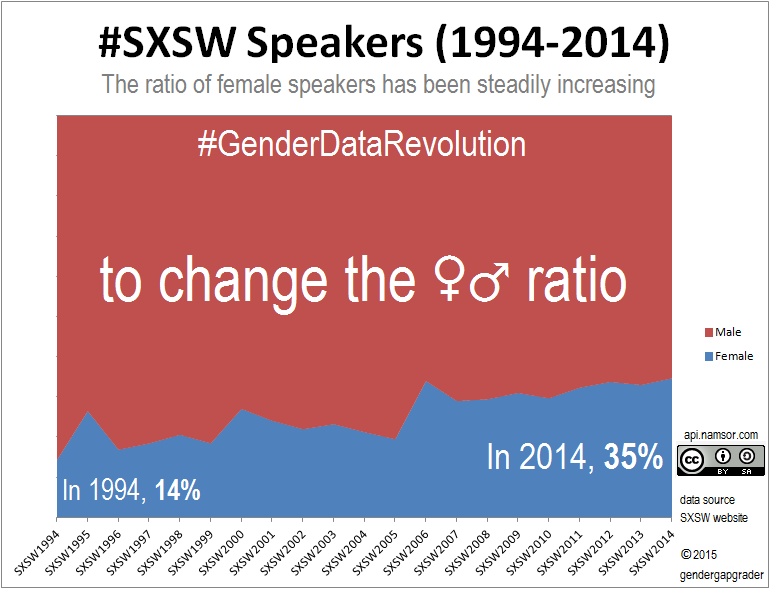 For the occasion, we’ve estimated the gender gap among SXSW Interactive speakers and we can see positive progress since 1994, when only 14% speakers were women – till last year SXSW edition when over 35% speakers were women. Are you a RapidMiner user? Watch this short tutorial on how to use NamSor API Key in RapidMiner, to estimate the gender gap (and other diversity analytics).